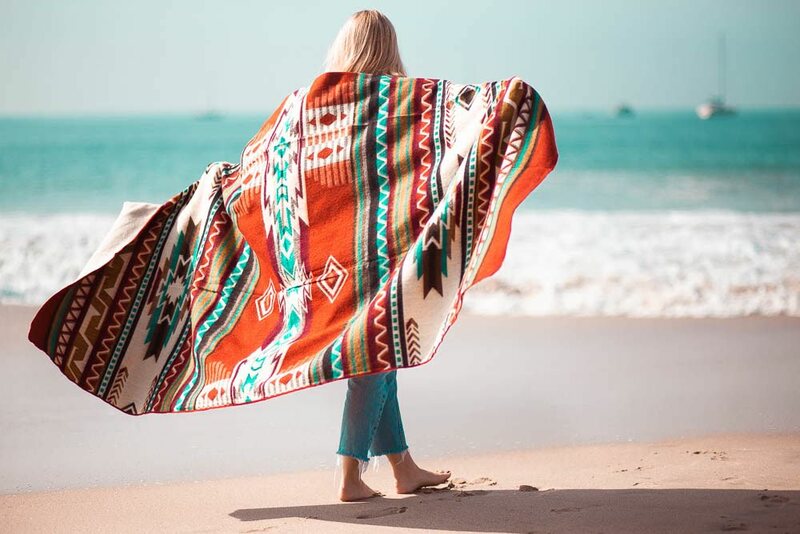 #1) Ecuadane blankets could actually be THE ultimate millennial hipster gift. These blankets are not only gorgeous, but of impeccable quality. They are statement pieces that can be used in the home for years. Artisana Arrow is my favorite design (I have this on my couch right now) it’s reversible. Ecuadane Cotachachi Water is another gorgeous design option. 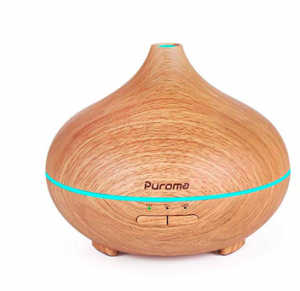 #3) A beautiful diffuser: affordable and pretty enough to sit on a nightstand. We picked this one off of Amazon, since it had the option to turn the light off, in case anyone is really sensitive to that stuff. 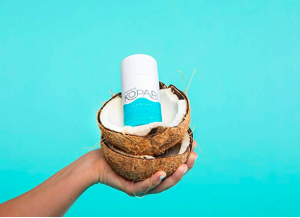 #1) KOPARI makes natural coconut oil based products that are good for you, smell amazing, and are quickly rising to be one the hottest of beauty trends! If you are looking for something that can be put in the stocking, while still keeping a bottle for yourself, I love the Kopari The Face Day Kit. 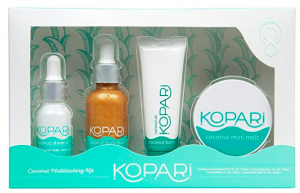 If you are looking for something a little bit bigger, I also love the Kopari The Coconut Multitasker Kit, which is the set with all my favorites! Finally, Kopari Natural Deordant that will change your life. This aluminum free all natural deodorant has sold out 5x on amazon already.USE CODE ‘THEBLONDESEYEVIEW15″ for 15% off your purchase! 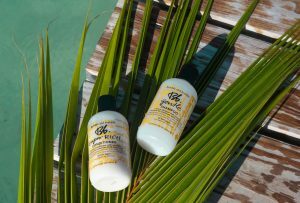 #2) Bumble and Bumble Shampoo and Conditioner: Don’t ever underestimate the power of a great shampoo/conditioner! Great products are not cheap, and I would LOVE to get some Bumble and Bumble from Santa this year. Including my favorites below! #3) Farmacy is my go-to brand for organic skin care. Some fantastic products to pamper someone you love! The honey face mask is extremely luxurious and the makeup remover is seriously in a category of its own. 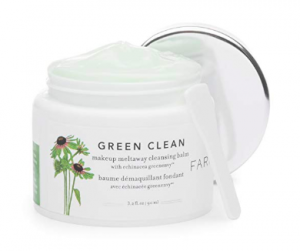 Farmacy Green Clean Makeup Remover (I have yet to meet someone who tired this and wasn’t blown away). 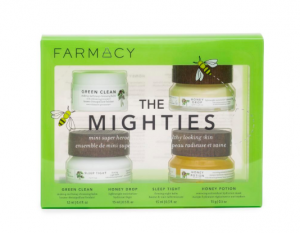 Again, if you are looking for a set, then the Farmacy Mighties set is a great intro set with some of their best sellers! I can’t get enough of the Honey Drop Lotion. 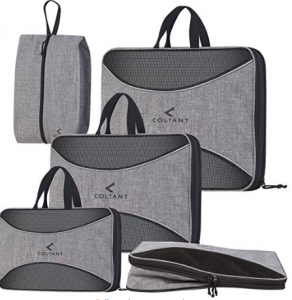 #1) Colton packing cubes: Once you travel with packing cubes you will never go back! The best thing you never knew you needed. I have a zillion of these, and Colton makes the best quality/sizes at only $35 for the set! 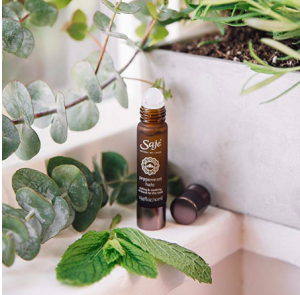 #2) Saje pepermint Halo: Another favorite from Saje, an essential oil roller for the head/temples that is equally refreshing and purifying! You’ll love this for airplane rides, promise. 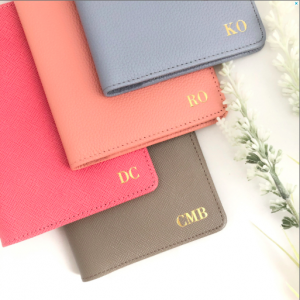 #3) Customized Passport Holder: My Bestie got me a custom passport holder and I LOVE it. Every time I travel I think of her! 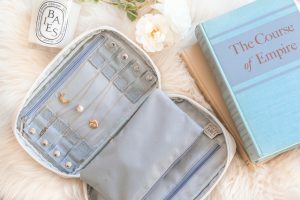 #4) Ellis James Travel Organizers: I love this company because they make affordable and stylish designs, and seem to think about the little details I need covered! They’re super affordable and easy to order on Amazon! This is my favorite way to bring all of my delicate necklaces so they never tangle. 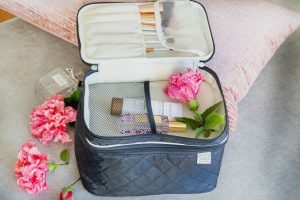 For something a bit bigger, the Ellis James Travel toiletries bag is perfect to keep makeup and toiletries, and has a a “shield” to keep makeup brushes from dirtying up the whole bag. 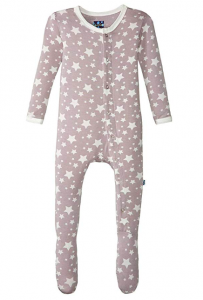 #1) Kickee Pants: These are the softest cuddliest little baby pajamas, perfect for auntie/baby snuggles. I am pretty sure my nephew has a lifetime supply of these! #2) Solly wrap: I don’t have any kids but yet I’m obsessed with baby-wearing with this ultra soft wrap. The perfect gift for new or expecting mom, it is so sweet to be holding a sleeping baby in one of these. Even cuter if you can get Dad to try it on. #3) Rock and Play: For a bigger gift, this is easy to store, light-weight, and rocks itself (I’ve been borrowing a friends for when my sister comes to visit!) 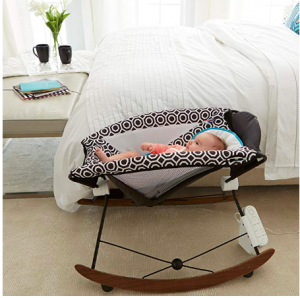 It also has a setting that makes gentle vibrations that puts baby to sleep in a jiffy. 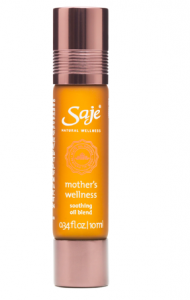 #4) Saje Mothers Wellness Blend: Ok, obviously I love this brand, but my sister used this during her labor and found it ultra relaxing. It smells heavenly, and if it can get her through labor then just imagine how amazing it is. 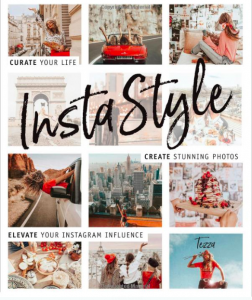 #1) Instastyle: Not only is this book beautiful enough for a coffee table decoration, but the author is THE influencer extraordinaire and provides all kinds of great info on content creation for influencers and aspiring creators! At only $16 it’s a must have item for the Gen-Z stocking this year! 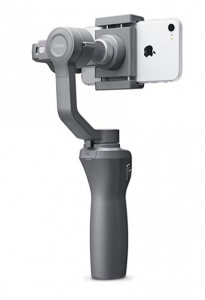 #2) Iphone Gimbal: Many people think that to be a blogger you have to have thousands of dollars of equipment and tons of camera knowledge to get out and start creating. But that could not be further than the truth, especially when most of us have an almost-professional equality camera in our pocket! For real, 90% of my video footage comes from my iPhone! The secret is in the stabilization! This gimbal makes for amazing footage anybody can take. #3) Light Up Selfie Iphone Case: It’s been on “the list” for a few years now, but the light up selfie case hasn’t gone out of style yet. For Him: The Hardest One of All! #1) Date Night in Box: This is exactly what it sounds like and it is a super easy way to do something fun with your guy. 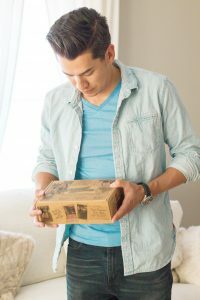 It’s a box sent to your house with a unique, cute and fun date! 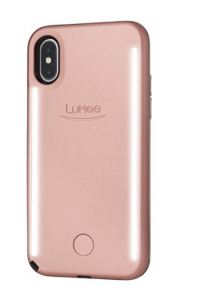 I’ve done a full review on the date that I did, if you’re wanting more information. #2) Airbnb Experiences: If you haven’t heard of these yet, AirBnb experiences are “activities designed and led by inspiring locals. They go beyond typical tours or classes by immersing guests in each host’s unique world. 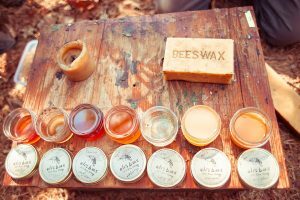 It’s an opportunity for anyone to share their hobbies, skills, or expertise without needing an extra room.” Last year for Christmas I got my husband the “bee keeper experience.” He loves bees and was over the moon to receive this gift! It was only $60! I have also gotten him surfing lessons for his birthday! There is something for everyone here! 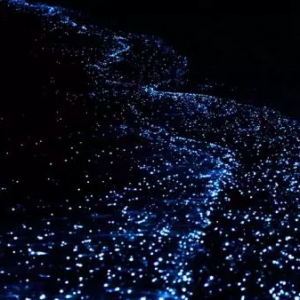 #3) Kayak at night through glowing waters (Pacific Northwest Specific): For all of my friends up in the PNW, this company offers “bioluminescent kayak tours.” For about a hundred bucks, why not lead Hubby on an adventure he would have never dreamed up! 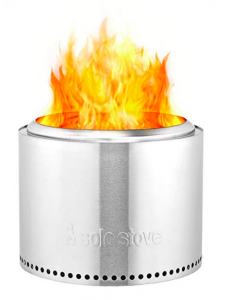 #3) Smokeless Bonfire (from SoloStove): I don’t know why, but my husband is obsessed with this, so I know it’s a good gift! We love having backyard bonfires, but hate having to move every 2 minutes from the smoke, and also that whole “campfire hair smell thing.” This stove had a huge kickstarter campaign and promises smokeless bonfires! 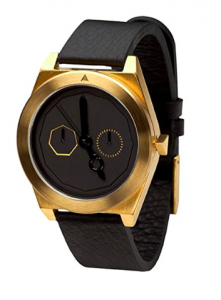 #5) Native Union Tech Accessories: For the guy who loves all the latest gadgets. 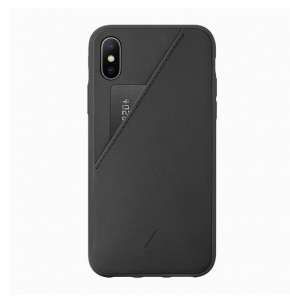 And at the very least, you might not be able to get him a gadget he doesn’t have yet, but how about so super sleek accessories to show em off!? #6) The Modern Bartender: Even if you don’t have a hipster hubby, everyone has that hipster brother-in-law lol. 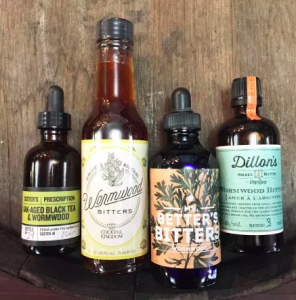 Craft cocktails are so in and taste incredible, and maybe if you’re lucky he will open up the gift on Christmas Eve and start shaking up some Christmas miracles. These are some of my absolute favorite things that I am going to be giving over the Holidays this year. Just writing about them makes me excited to see the faces of the lucky people that are going to be on the receiving end of this awesome stuff. Hopefully you can find something on here for all of your loved ones! This is a GREAT gift guide. Thanks for all the ideas/info! LIVING by this gift guide! Thanks for sharing!